Dr. Jeffery Glover and I are currently creating an interactive web-map for the Flat Rock Archives. The map will be created through ArcGIS, a geospatial mapping software. It will feature the graves within the Flat Rock Cemetery, a search engine to find a particular resident and a biography that pairs with that particular grave. This collaborative project is slowly making the history of Flat Rock accessible in a way it never was before through the creation of an interactive map, which helps expand the inspirational story of Flat Rock. 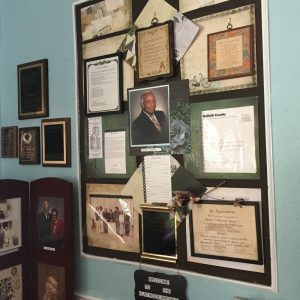 Dr. Glover initiated the Flat Rock Cemetery Mapping Project in 2008 in partnership with the local Flat Rock community to help document, study, and preserve their historic African-American cemetery, which was actively used between the mid-19th century and 1959. This project has been a great lesson in the positive benefits of doing public, community-based archaeology. The unincorporated community of Flat Rock, Georgia, is one of the oldest continuously occupied African American communities in Georgia, beginning in the waning days of slavery and surviving war, Jim Crow, depression, the KKK, and the Great Migration of African Americans to the north in the twentieth century. There is a place in the South River, which flows from present-day Atlanta southeast and empties into the Ocmulgee, where the underlying granite bedrock is exposed, providing an excellent river crossing. The Native Americans, who called the river Weelahnee, crossed here and the first European Americans followed their trails. Today that stretch is called Panola Road and the area around it unincorporated Flat Rock Community. In 1821 the area was lightly settled by the Native Americans. Cherokee towns lay to the northwest on the Chattahoochee River. Creek towns lay to the south. DeKalb County (formed in 1822 from Henry County to the south) was within Creek territory but functioned essentially as a buffer area between the two tribes. In 1821, after the Native Americans were forced to cede the land, European Americans held a land lottery and began to establish farms in the area and brought with them their African American enslaved people. The terrain did not lend itself to the large cotton plantations of the coast or even the Black Belt just south of DeKalb County, hence the farms were more modest and the number of slaves per farm was smaller. By 1846 Flat Rock was becoming somewhat of a backwater as the old roads gave way to the new organizing principle of the railroad. The Flat Rock Community in the early twentieth century was a rural farming community, growing cotton, corn, wheat, oats, produce, sorghum cane, peanuts, as well as cows, chickens, and pigs. 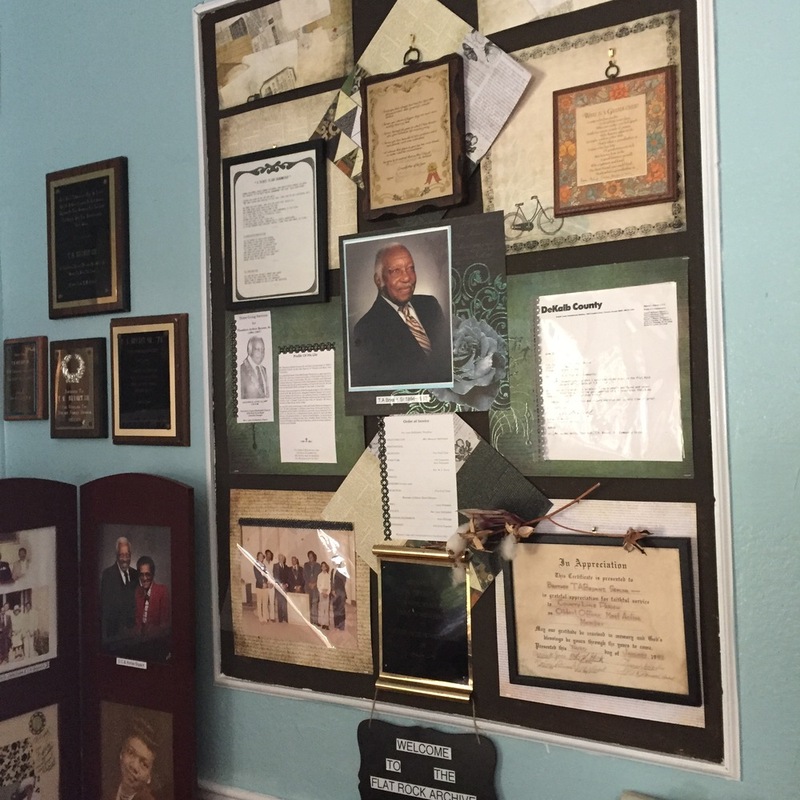 Although many families make up the Flat Rock Community, Reverend Bryant’s family embodies it. His grandfather Spencer Bryant (1864-1946) was a trustee in Flat Rock Methodist Church. His father, T.A. Bryant, Sr. (1894-1987), was also a trustee, as well as a high-ranking Wishful Master in the Masonic Lodge. T.A. Bryant, Sr., played an important role in keeping the community together when so many African Americans were leaving the south for jobs elsewhere. But the forces of racism also shaped the Flat Rock Community. African Americans were not allowed to own property on major roads; roads, where they lived, were not maintained by the county; by law, their schooling could not exceed the seventh grade and they were not allowed to attend the white schools nor were schools provided. In 1947 the Flat Rock School was rebuilt across the road from Flat Rock Methodist Church and the Masonic Lodge once again inhabited the second floor. But only three months after it was built, the DeKalb County African American schools were consolidated under the Jeanes plan to give students access to better resources. Thenceforth, Flat Rock Community students were bused to Lithonia Colored School, which had been built in 1938. (It was subsequently renamed Bruce Street School when textbooks intended for the white school were erroneously delivered there). Flat Rock students had to ride in the back of the bus which also took white students to school in Lithonia. The lodge continued to meet in the old school building until it was burned in 1981, presumably by white youths seen leaving the area. The 1990s brought big changes to the area as Atlanta suburbs expanded and subdivisions popped up on every road. In 2005, Flat Rock United Methodist Church purchased land around the corner on Evans Mill Road and once again built a more modern structure. In 2006 Flat Rock Archive was incorporated as a non-profit in the Bryant home on Crossvale Road.